One big box containing the Alhambra base game plus five expansions. packaging is designed to store the expansions separately. Alhambra is a light game by itself but add in all the expansions and it's a big hit, with lots of variety and replayability. Similar to Carcassonne, you build your own city by bidding on tiles, with a few restrictions. Easy to learn and play, highly recommend! When you consider what's actually in the box, this is an incredible bargain. Something like 16 (or 20? I forget) mini expansions, along with the base game. But each of the mini expansions is stand-alone, meaning that you can choose exactly which expansions you want to play with, and mix and match. That's 65,536 ways to combine them. :-) If anyone tries them all, let me know which combination was best. So versatile with all of the expansions included, you can make each game feel different from the rest. Definitely a favorite for the ease-of-play vs. strategy-pay-off feel to it. The possibilities are almost endless! With five expansions, each containing 4 or more different ways to change the game, there is no limit to how intricate your game can be! 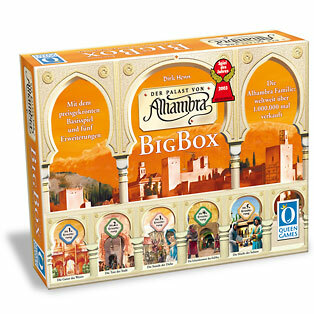 The Alhambra Big Box set in an amazing deal where you get the base game and all 5 expansions (i.e. 20 mini-expansions) in one bundle. I bought this as a gift for a friend (since I already have all the sets myself) and found this to be a cheap way to aquire the full set. I'd recommend the Big Box to anyone who has tried the base game and likes it - you know you will eventually want the the expansions anyway!